From formal holiday gatherings to casual game nights, Taste of Home Holidays & Celebrations makes the most of every get-together. Divided into four sections (one for each season of the year), this colorful collection is sure to be your most-trusted source for unforgettable parties, dinners, buffets and more. Whether hosting a formal Christmas dinner, spooky Halloween party, succulent Thanksgiving meal, glorious Easter brunch, neighborly barbecue or quant bridal shower, Holidays & Celebrations helps create incredible memories that last a lifetime. From Sunday morning brunches and festive Christmas dinners to casual backyard barbecues and haunting Halloween parties, it seems there's always a reason to gather with family and friends for fun and, of course, food! 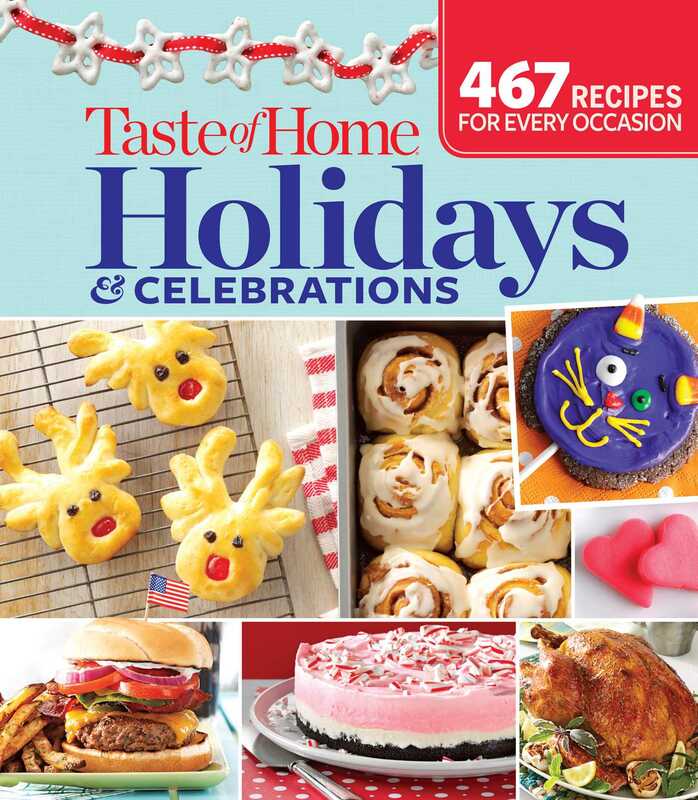 Featuring more than 350 recipes, Taste of Home Holidays & Celebrations promises to turn every occasion into a memorable event. Divided into four sections (one for each season), this colorful cookbook is sure to become your most-trusted source for party planning, holiday fun, cozy get-togethers and more. Turn to the spring section for Easter mealideas as well as St Patrick's Day celebrations, Cinco de Mayo buffets, Mother's Day breakfast items, bridal shower favorites and more. The summer area of the book offers recipes for Fourth-of-July festivities, family reunions and block parties, and other warm-weather celebrations you'll be excited to be a part of . As autumn rolls in, turn to this cookbook for dozens of Halloween recipes, tailgating specialties and bake-sale staples. You'll also discover formal Thanksgiving menus as well as recipes for a casual Turkey-Day get-together and an easy Black Friday lineup. Hosting an open house or round robin this winter? Turn to the winter section of Holidays & Celebrations. There, you'll find plenty of party ideas, including an after­ sledding gathering, a New Year's countdown and a Super Bowl party. Christmas couldn't be more festive than with the splendid dishes found here. Keep impressive yet easy yuletide menus at your fingertips and create cute holiday treats for little ones. Attending a cookie exchange? We have wonderfully sweet sensations lined up for you. You'll also discover how simple it is to host a merry open house, bake up a few gifts from the kitchen and celebrate Christmas morning with family and friends. After all, with Holidays & Celebrations it's never been easier to make the most of every occasion-all year long!